2 cycling courses choice! with the chepest prices! 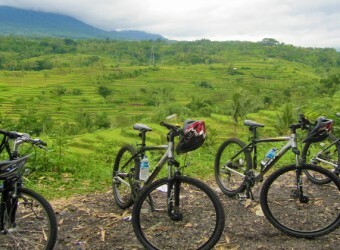 Activity The cheapest package for cycling in Bali! Jatiluwih Course has 3 types of the courses: short-17 km, normal-22 km and expert-28 km which have up - down points through rice terraces in Tabanan. Kintamani course for beginners which is 30 km and most course is going down. The support vehicle and the mini truck are going alongside you to support! ※This Menu is not available. ・The support vehicle and the truck which carries bicycles go with you. ・If you get tired in the middle of the course, you can leave the bicycle on the truck and move by the truck. Arriving at Restaurant "Nami Rasa"
※Additional charge Rp.130,000（car/both way） for Tanah Lot area and other area. Do other guests go cycling together? When it is a small number of the poeple booked, the tour might be with other guests. How many people can one guide help? Usually one guide guides one group. Can children join the cycling? Children have to be over age 12 and 140cm. What kinds of the mountain bicycles are available? There are 3 types: mens, ladies and children. Before the cycling starts, the guides adjust the height of the chair. Does the tour include breaks? It usually has 2-3 breaks during the cycling, but you can request it. Also, you can askl the guide to stop for the photo time. What can I do if I get tired in the middle of the course? The support vehicle comes together for all the courses, , so you can move by the car as well. Is there a restroom in the course? ※The fee and the schedule might be changed without any notice by the sponsor. ※The insurance does not cover damege of the belongings. Lake View Restaurant in Kintamani is so great. It designed in open air, it seems hot in it but the wind that blows from the outside was chilly. Guide also enjoyed cycling. Bike is portable and lightweight. It’s convenient!! I was sweating much after cycling about 2 hours. Village streets in Bali!! I fully enjoyed untouched nature and negative ion much.